How does discrimination hiring occur? What is the best way to write a legally compliant job description? Can I only hire fans of the New York Yankees?? When it comes to hiring a new employee, there are certain things that an employer legally can and can’t do under federal and state laws. 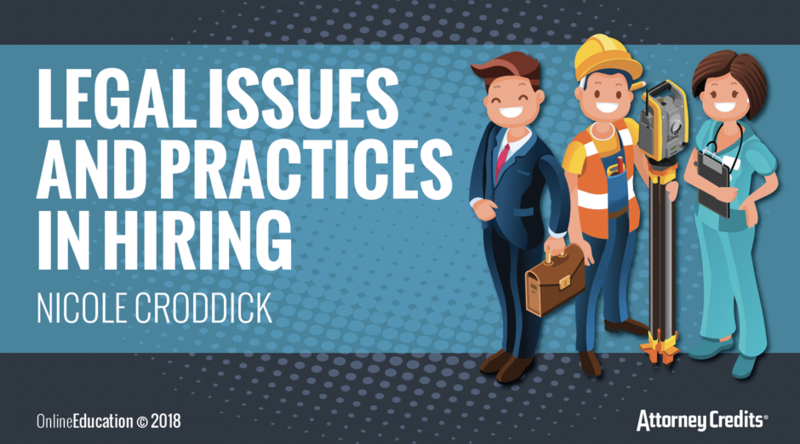 Nicole highlights the common pitfalls that cause employers to end up in lawsuits over hiring and she provides highly practical information to help your clients avoid these common issues. Nicole Croddick provides you with in-depth legal guidance when counseling your business clients on screening, interviewing and hiring new employees – from posting the job ad to steps to take once hired. To access this course please click here: Legal Issues and Practices in Hiring. Nicole Sorokolit Croddick is Counsel at Davison, Eastman, Muñoz, Lederman & Paone, P.A., where she focuses her practice on employment and labor matters. She consults companies on human resources issues and has conducted internal investigations on ethical and legal violations. AttorneyCredits offers CLE for attorneys in New Jersey and around the country. For more information about CLE in New Jersey please click the following link: NJ CLE.